Steady freight and home time. Run your business in the ports. You and/or your drivers will get home daily and bring home bigger weekly settlements. It’s your business; you should be able to run it the way you want. As a Port Dray owner-operator or fleet owner with Schneider, you can. You’ll have the option of operating on a Local or Regional configuration. Choose the schedule that works for you and your business. One of the advantages of operating in the ports is that you or your fleet enjoy frequent and predictable home time. Local Port Dray owner-operators get home daily, while Regional Port Dray owner-operators are typically home at least every other day. Fleet owners may have slip-seating options available with their truck in some markets. 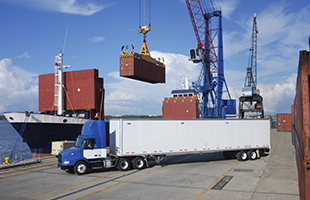 Your business will benefit from access to no-touch freight that’s available year-round. Whether you are on a Local or Regional configuration, you’ll haul drop-and-hook ocean containers to and from the ports. Schneider continues to grow its Port Dray freight base, creating more owner-operator and fleet owner opportunities in more areas. Say goodbye to uncertainty when it comes your bottom line. Schneider Port Dray owner-operators bring home reliable weekly settlements. Each driver can average $100,000-$130,000 in annual revenue, depending on location. Port Dray leases allow a tractor to be 2000 or newer. However, to be California CARB compliant, the tractor must be 2010 or newer. Tractor must pass DOT inspection.